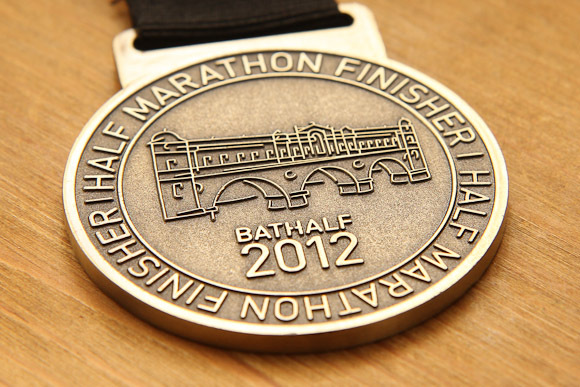 I approached this year’s Bath Half Marathon with more than a little trepidation, and rightly so, it turned out. Since the Bristol Half, I just haven’t trained enough. Partly that’s due to winter, and partly because my routine’s been knocked off‐kilter by quitting my day job. I also put on some weight over the last half of 2011 that I’ve not managed to shake off yet. I mused on this during the approach to Bath, in a coach from Bath Racecourse. I really recommend their Bath Half park‐and‐ride service, by the way. You park at the racecourse, then wait in a nice warm room with a bunch of other runners (and decent toilet facilities – very important before a race! 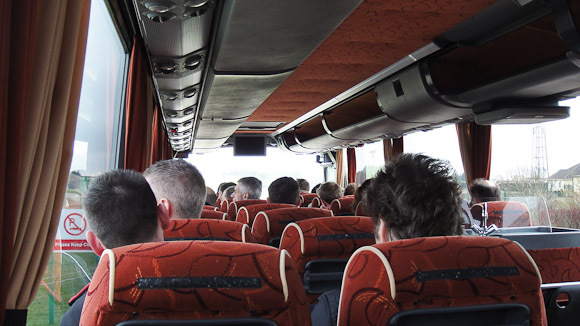 ), then get taken into town in a nice coach. The shuttle service back after the race runs until 5pm, and it was only £9 including the booking fee. Anyway. Yes, I was underprepared. The longest distance I’ve done since September was 10km, and that’s just not enough distance training for a half marathon. On the other hand, everything else was going well. I’d made sure to eat right and get enough sleep for the few days before the race, and I woke up feeling refreshed and pretty cheerful on Sunday morning. On the way to the start, the weather seemed ideal for running, cold and overcast, but not too cold. 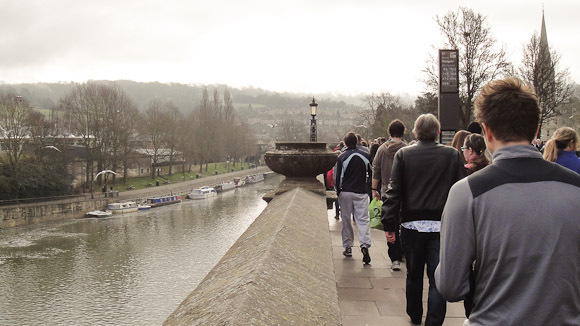 Also, because this was my second Bath Half, I knew a lot more about what to expect, from where to find the Runner’s Village to the course itself. Standing in the long queue for the start line, there was the usual chit‐chat with other runners. The nerves of starting and a shared purpose mean that people are happy to natter to complete strangers and compare experiences. I forgot about my lack of training, and just got into the running mood. And that was the way I stayed, for the first lap, at least. The grey skies lifted and the sun came out, which is good spiritually, but not ideal for running – a lot of people I’ve spoken to since said it was too hot for them, and I agree. I was feeling distinctly overheated by the sixth or seventh mile, and starting to lose some of my chipperness. That said, the friendliness of the Bath Half course did a lot to keep me buoyed up. The rock band out on the pavement, the people cheering from windows, the drummers in Queen Square – all great for keeping you going. But, sadly, with my lack of training, something had to give. Looping back past the start to begin my second lap of the course, I was already feeling like I’d run out of steam, physically at least. My feet were starting to feel sore (I ended up with some nice blisters), the heat was getting to me, and my muscles were running on empty. Neither plenty of water nor the gel food thingy I ate helped much. I was tired, and getting more tired by the mile. Time to start running on sheer bloody‐mindedness, then. I concentrated on putting one foot in front of the other, and keeping up a jog of some kind. It didn’t matter what kind, or how fast, as long as I kept up something that looked and felt like running rather than walking. And I carried on. I got slower as the miles went on, as you can clearly see in my RunKeeper track, and I wasn’t enjoying myself much, but I tried to keep my mind off that as best as I could. I thought of other things, I counted how many times I passed the bleach‐blonde woman who was alternating walking and running, I enjoyed the comedy outfits. The safari team who (by dint of clever costumery) included one member being carried in a cage by a gorilla got my “costume of the race” award, by the way. And, eventually, I made it to a point where there were only five kilometres to go. That was an important psychological point, because I can always run 5K. 5K is my default distance. 5K is the distance I’d run in my sleep, were I prone to somnambulation. In the last couple of miles before the finish line, you start to get more personal encouragement, too, especially if you’re back with the rest of the straggling, thinned‐out crowd. “Just two miles to go now!” wasn’t too helpful, as two miles sounded like a hell of a long way, but the regular “Keep going!”s and “You’re doing great!”s were welcome. As were the “It’s just around the corner now!”s (which started, truth be told, about a mile away from the final corner, but hey.) Once I was on “final approach” I knew I was going to make it without walking, and I just kept plodding on. In the end, I crossed the finish line overheated, astoundingly tired, and with very sore feet, at 2:58:44. That’s a whole ten minutes slower than I managed the Bristol Half, and pretty disappointing. On the other hand, I was bloody happy to have not given up, and I still felt like I’d accomplished something, once I’d recovered a little. I did it. I jogged all the way around, albeit slowly, and at least I came in under the three‐hour mark.